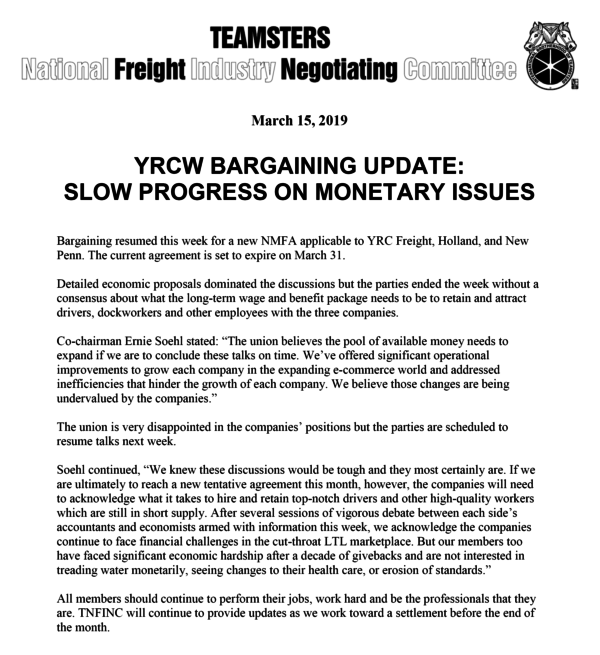 Mar 18, 2019 - Teamsters Local 89 has received an update from the IBT concerning contract negotiations with YRC. This agreement covers YRC Freight, USF Holland, and New Penn. In the update, which you can read here, the IBT reports that there has been slow progress on monetary issues. Talks are scheduled to resume this week. The current agreement is set to expire on March 31st. 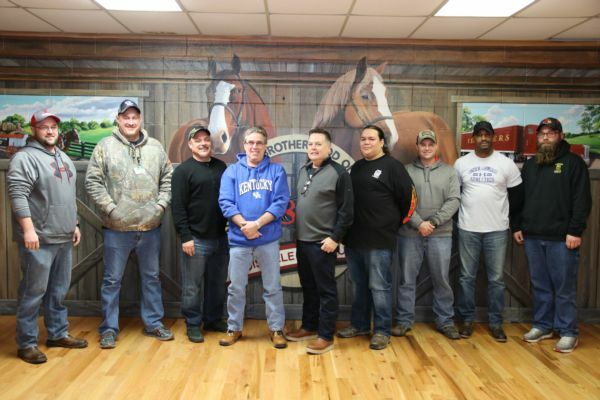 Jan 20, 2019 Today members at Zenith Logistics, commonly referred to as Kroger Warehouse, met at Teamsters Local 89 for contract explanation meetings and afterwards voted to ratify a new six-year agreement by an overwhelming 94%. “It’s one of the best contracts we’ve ever won,” said Trey McCutcheon, a member of the union negotiating committee. 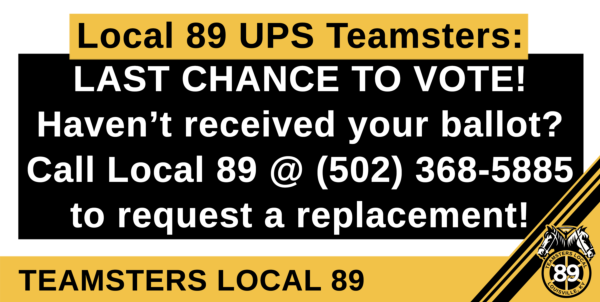 Last evening Teamsters Local 89 received notification from the IBT that UPS Freight had submitted a “Last, Best, and Final Offer” to the Teamsters National UPS Freight Negotiating Committee. Teamsters across Kentucky and Southern Indiana have an important decision to make when they go to the polls on November 6th. Your Union has endorsed the following candidates. 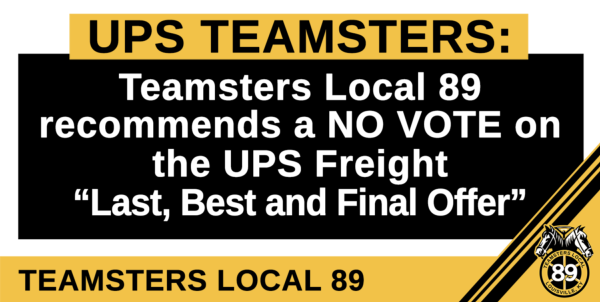 Oct 08, 2018 - PREAMBLE – Teamsters Local 89 completely opposes the IBT’s decision to ratify and implement the UPS Contract. It is a vile, reprehensible, and abhorrent act that will damage the very foundation of our Union for decades to come. 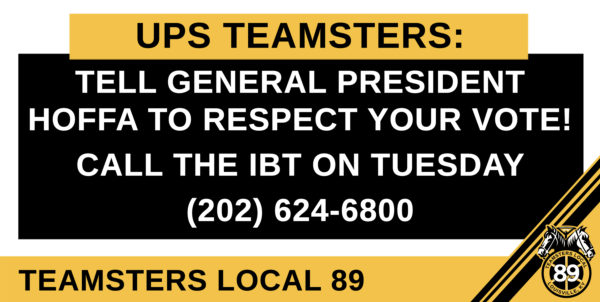 This action by the IBT will haunt the Teamsters and the Labor Movement and is a betrayal of everything we stand for.